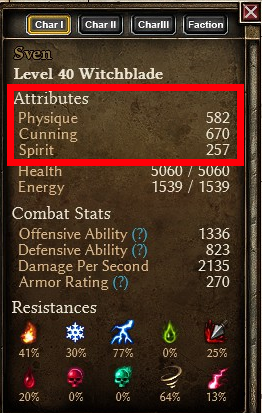 Its no question that a lot of people want to know how many attribute points were invested between each of the three primary attributes on a particular build, and its also no question that a lot of build-posts can't give a precise answer and instead say something along the lines of "I think I went 1/1 Physique/Cunning". I myself am guilty of this, but I've decided to rectify it with the following guide. So I pumped 33 points into Cunning. Kind of a lot. 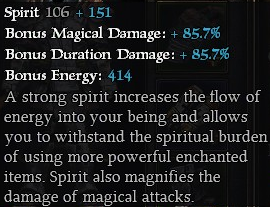 The remaining 7 points available to me were invested into Spirit. Kind of an awkward choice. Gotta fit those low-level rings, though, amirite? I hope this helps people more specifically detail how they allocated their points in a build, that the community might benefit as a whole from the information. Thanks Ceno! I myself just found the attribute tool tips a few weeks ago, and have used it as I've been leveling. I hadn't thought about using math to figure out how many points I spent. I've added the thread in the Resource section of the Build Compendium. Hopefully more people will be a bit more accurate with the attribute point distribution in their builds. This. Is. So. Helpful. TY. Yeah I also knew about this as it was on someones else post about his build, but I don't find it overly important. Reason being is attribute points in the long scheme of the build are mute. You put how many in each you need to equip items. So for everyone who does the build it can be different, as they probably will use different gear then you did. I know it, you know it, others know it...but no one's really shared it with those that don't know it. Power to the people! Actually I needed this because if I'm trying to make sure I can equip certain things, I need to be able to keep track of exact distribution of attribute points. This makes that process accurate and easier. Thanks for posting this Ceno, this is good information to know! Thanks for the formula - had been wondering how to divine how many points I had spent, way simpler than I thought! Thank Ceno for this. 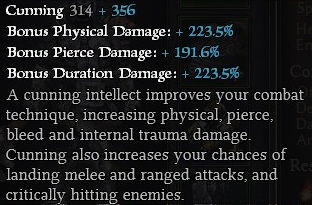 Being an engineer but never do the math in arpg myself though so this is helpful.